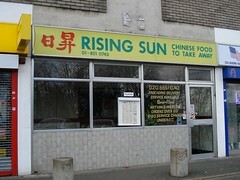 A Chinese takeaway in the parade of shops opposite Grove Park Station, which has been trading for over 20 years. According to signs in the window as of December 2008, they offer free delivery from 6pm to 11pm within 2 miles on orders over £12, otherwise there is a £1.50 service charge. Last visited by Nick, 29 Dec 2018. Opening hours confirmed by Nick, April 2008. Last edited 2019-01-02 14:00:27 (version 8; diff). List all versions. Page last edited 2019-01-02 14:00:27 (version 8).